ONE NOZZLE: The Olsson Ruby will work with a huge range of materials. PLA, ABS, CPE/PET, Nylon, and composites with abrasive additives such as Carbon fibre, Steel, Wood, Boron Carbide, Tungsten and Phosphorescent pigment, are some of the materials sucessfully tested so far. HIGHLY WEAR RESISTANT: The ruby mounted at the tip makes sure that even the toughest materials will be printable. It was originally designed for printing with Boron Carbide (B4C), the third hardest known material in the world. 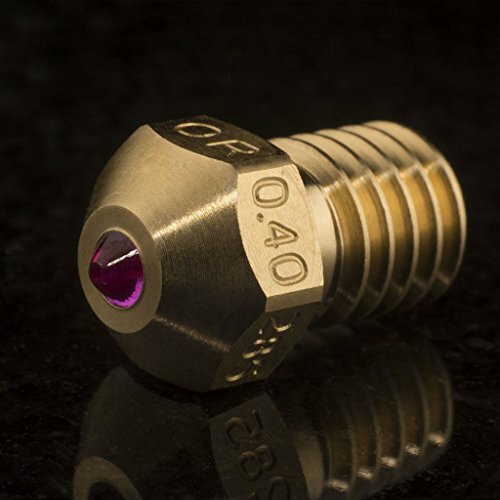 EXCELLENT HEAT CONDUCTIVITY: Since most of the Olsson Ruby is made from brass, with its excellent heat conductivity, performance and throughput is first-class. VERIFIED PERFORMANCE: People all over the world have been testing different iterations of the ruby nozzle since early 2016. We are very happy to have received only good printing results from this community. MANUFACTURING QUALITY: The Olsson Ruby is manufactured, assembled and tested in a high-quality facility in Sweden. This is why 3DVerkstan guarantees the very best quality and tolerances. SPEED: By using the 0.6, 0.8mm and High Output versions it is possible to reach a higher throughput and speed than ever before for abrasive materials, while retaining wear-resistance and reliability. If you have any questions about this product by Olsson Ruby, contact us by completing and submitting the form below. If you are looking for a specif part number, please include it with your message. [Gulfcoast Robotics] RepRap 3D Printer High Print Speed Print Pack 1.75mm Filament + 5 nozzles, 24V Heater and Thermistor.